This past season felt like a fresh start for the Youth Team at Hamp Crew. Winter training lasted well into April, so when it came time to get out on the water, we were filled with a nervous excitement prompted by the encouraging words of the new coaches. If we showed our dedication and put in the right amount of work there was nothing stopping us from the chance to win races. This coaching philosophy was exactly what we needed. We had spent so much time as a “middle of the pack” team, the attitude of the new coaches was inspiring. The coaches asked each of us to carry the responsibility individually, which was a little intimidating, but at the same time empowering. The coaches made us realize that it was entirely up to us. If we want to win, we have to decide together that we are putting in the work to get there. Winning will not just happen, but we can achieve it if we work together, and individually pull our weight for our teammates. After a few weeks on the water we had settled into our racing season. We had a test week on land for varsity rowers that tested our mental and physical strength. This week was a huge growth period for our varsity team as a whole. There was so much support between varsity rowers; coaching each other through pieces, encouraging people to push through the pain, all of which brought our team together and helped us with team dynamics and our performance on the water. At our races each weekend, we got progressively more successful; not just in that we started placing well in races, but we grew as a team. The Lowell regatta was definitely a turning point for the season. Our varsity boys 4+ and varsity girls 4x both performed well, and it was exciting to see our hard work paying off. The following week in Worcester was the Northeast Youth Championship. Although we did not progress at this regatta, both our boats met their goals for the day. Our boys four had a rower unable to come to this race. 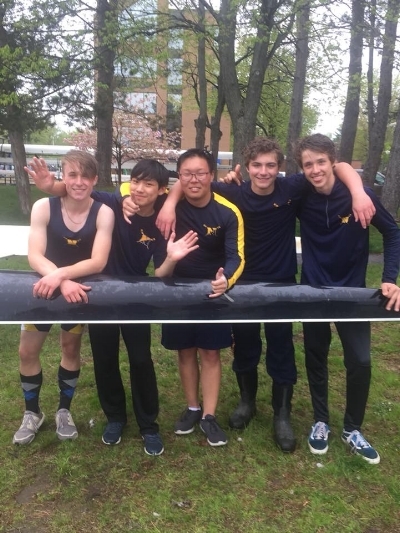 In his absence we had a novice boy who jumped right in and showed us all his ability to adjust at an incredibly fast pace to race in the varsity four. Our last race weekend was a huge success! Our varsity girls 4x and varsity boys 4+ both placed first in their races. Our novice and varsity teams bonded this season more than they have in the past. Having mixed boat racing the last week, and taking out mixed boats during practice helped our squads feel comfortable with each other. Looking ahead to next year, we are very excited for what is coming. This year has been a growing period for Hamp Crew. We are getting back on our feet thanks to the dedication of our new coaches and the passion of our youth rowers; they’ve stuck with the team despite so many changes. We only had one graduating senior this year, and next year the majority of the team will be upperclassmen. We’re already fast, but we are working on getting a lot faster. Both the boys and girls squads have a ton of room to grow, and plenty of time to do so. That’s the biggest thing. We are so grateful for Coach Beth, and Coach Rob for sticking with us. They have truly transformed this team for the better. We are working for goals that we never thought were possible until they showed us there is nothing standing in our way. Thank you Hamp Crew for an amazing season of rowing. We are so excited for next year and what is to come for this team! Newer PostThis is Who We Are.